Scratch brownies! 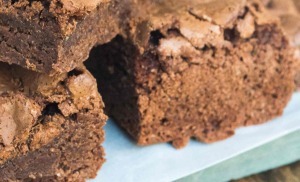 Sweeten them up with a chocolate icing glaze and your brownies will be gone in no time at all! Gradually add in the eggs, while beating. In another bowl, mix the rest of the dry ingredients together. Slowly fold in this flour mixture. Pour it out into the pan and fill out the corners. Cool on a cooling rack for at least 30 minutes before serving.